Edward St John Daniel signed up for three years service in New Zealand, after which time the NZ Government had promised grants of land to the Settlers. Daniel sailed to New Zealand aboard the Gresham, which arrived at New Plymouth, Taranaki Province, North Island on 15th February 1864. Daniel's Company of Taranaki Military Settlers took part in many operations against the Maoris in South Taranaki during the next three years. On 8th August 1864, Daniel was sentenced to 168 hours intensive labour for an unspecified offence. He was released on 15th August but confined again on 30th August. He was tried by Regimental Court Martial on 2nd September and released on 13th October 1864. No records of any further offences committed by Daniel while serving with the Taranaki Military Settlers have come to light. 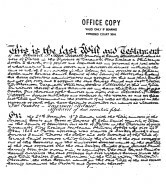 On 3rd October 1866, Daniel made his Last Will and Testament. He gave his domicile as Patea, Taranaki Province. Daniel left everything "including the land to which I am entitled in this Colony for my services as a Military Settler" to his father, Edward Daniel Esquire. In May 1867, the Taranaki Military Settlers were disbanded when a temporary peace occurred in the Maori Wars. It has been reported that Daniel received his land grant, which he sold soon afterwards, but the evidence for this is unclear and ambiguous.